Friends and family will enjoy a moment of relaxation at any point of the day with this relaxing gift filled with teas, goodies and a candle! With a wide selection of tea flavors worth sipping on including Earl Grey, Sweet Peppermint and more! They'll also love nibbling on wonderful shortbread cookies in a variety of flavors that dunk and delight. Honey and rock candy will sweeten their tea in style. 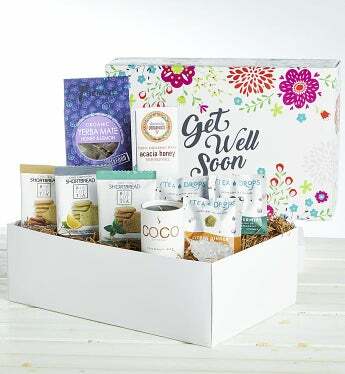 No stress with this gift, just pure relaxation for them to get well soon.